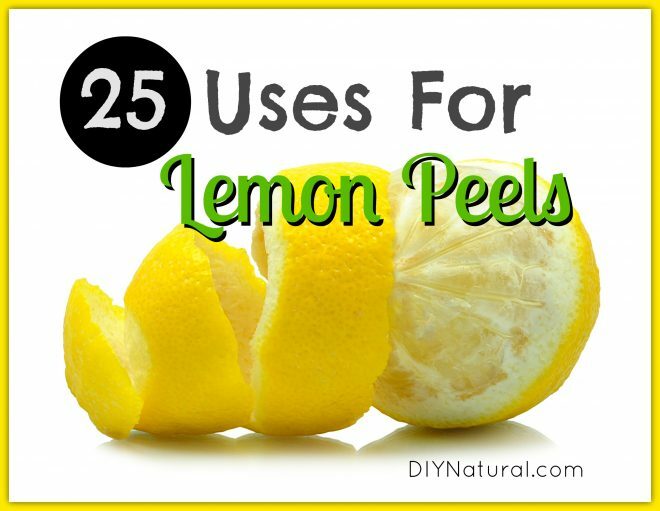 Lemon juice has so many household uses, but don’t toss those peels after squeezing your lemons! Use the whole lemon – juice, pulp, rind, and all. After squeezing lemons, hold onto those lemon rinds and check out our list of clever uses to be sure you’ve used the lemon to its fullest! What makes lemons so useful? Lemons are a versatile, natural option for cleaning, beauty, cooking and much more. Not only do they smell and taste great, but they possess antibacterial properties making them perfect for killing germs. Their low pH makes them perfect for beauty and personal care, and when applied directly to skin, lemon juice can lighten age and sun spots. Lemons have a high concentration of citric acid, which is great for general disinfecting and cleaning. The citric acid in lemons can help kill bacteria and mold, and also remove soap scum and mineral deposits. Sprinkle baking soda into a wet sink or bathtub, and use the cut side of a lemon to scrub these surfaces. This method will remove grime, act as a lemony “bleach,” and make sinks and bathtubs shine. Lemon not only acts as a degreaser, but the citric acid found in lemon also helps remove spots from dishes. Throw lemon rinds with the pulp into your dish water to help remove grease and make glasses and silverware sparkle. If you have half a lemon that has been squeezed, there will still be enough lemon juice in the remaining pulp to remove stains. Rub the half lemon on grease or underarm stains on garments. Allow it to sit overnight. For tough stains, sprinkle a bit of baking soda over the lemon-soaked stain and scrub, then wash as usual. The acid in lemons works to dissolve hard water deposits and burnt coffee stains from your coffee pots. To a cool coffee pot, add lemon rinds, a few tablespoons of salt (as a mild abrasive), and a cup or two of ice. Swirl ingredients around in the coffee pot for several minutes, or until stains are completely removed. If stains are stubborn, leave the mixture in the coffee pot and soak for several hours or overnight. Rinse coffee pot well before using again. Hard water stains are due to minerals in water, and soap scum is the result of the minerals in your water reacting with your soap. We already know from the coffee pot trick that lemon works great for removing this buildup. Take half a lemon rind with pulp intact, sprinkle salt inside it if desired, and rub directly on shower doors. Rinse well when finished. This is one of the simplest ways to use your leftover lemon peels. Add the peels of several lemons to a large jar, and fill with white distilled vinegar. Allow the solution to “steep” in a cabinet for a few weeks. Strain out the peels, and use the vinegar solution as a great lemon-scented all-purpose cleaner…perfect for de-greasing, disinfecting, and leaving things smelling fresh. Add the citrus-infused vinegar to a spray bottle and use to clean countertops, sinks, toilets, spills, stovetops, or other surfaces. Lemon does a nice job of eliminating odors that are trapped in your cutting boards (like garlic and onion!). It also sanitizes boards due to its antibacterial properties. Take half a squeezed lemon with pulp intact, and rub vigorously over a cutting board that has been sprinkled with a coarsely ground salt (like kosher salt). Rinse well and allow to dry. If you have lingering odors on your hands from chopping things like garlic or onions, rub lemon rinds on your fingers, nails, and hands to leave them smelling fresh again. Smelly garbage disposals can be freshened up with leftover lemon rinds. (I’m always careful to put smaller chunks down the disposal so it doesn’t clog.) Simply drop rinds down the disposal with a few ice cubes and run the disposal. Put one or two lemon halves, that have already been squeezed, into the microwave for about 15-20 seconds. Carefully remove the lemon halves and use them to clean the inside of the microwave, as well as the stovetop and the range hood. Rub lemon halves onto surfaces, then wipe clean with a wet dish cloth. The acid in lemons helps remove rust stains. This can be helpful in showers where shaving cream cans have left a rust ring, or sinks where iron pots have been left. Sprinkle salt on the rust stain and rub with half of a lemon that still has pulp inside. Allow the salt and lemon to sit for several hours, scrubbing periodically if needed. Allow the lemon to rest on the surface overnight if the stain has not yet disappeared, then rinse well with water. The acid content in citrus rinds can whiten and brighten dull or stained teeth. Rub the inner white part of the lemon peel on your teeth for a few minutes for a whitening effect. Rinse well with water after using the citrus peels. I love this remedy because you will notice almost immediate whitening effects! Note: Use this remedy very sparingly to avoid damage to tooth enamel or tooth sensitivity. Vinegar makes a wonderful conditioning hair rinse, whether you’re using homemade no-poo, or just want shiny, healthy, pH balanced hair. The addition of lemon to your homemade conditioning rinse will help keep a greasy scalp and hair under control, while improving dull hair and resolving many scalp issues. Add the peels of several lemons to a jar, and fill almost to the top with apple cider vinegar (we use this kind). Allow it to sit for 1-2 weeks and strain out peels. Add about 1 tablespoon of this citrus vinegar solution to 1 cup of water, and use as a conditioning rinse after shampooing. Allow the rinse to remain on hair for a few minutes, then rinse out or just leave in. Lemon’s low pH makes it a perfect skin toner. You can rub the inside of a juiced lemon directly onto sun spots and age spots to lighten them. Just allow the juice to dry on skin, or rinse off after 15-20 minutes. Repeat every day. You can also use the inside of a juiced lemon as the first step in a luxurious skin-brightening facial. Rub the inside of the lemon all over your face, then apply a honey mask on top of that. Rinse off after 20-30 minutes. This is the perfect trick for softening elbows that are dry and scaly from winter weather. After juicing a lemon, take the two halves (with pulp intact) and sprinkle baking soda inside them. Stick elbow inside lemon half, twisting and turning the lemon on your elbow to exfoliate and soften. Optionally, you can then set lemon halves on a tabletop and rest elbows in them for several minutes before rinsing and drying your newly softened elbows. Since the rinds of citrus fruits contains high levels of Vitamin C, you can make your own Vitamin C powder with lemon peels. Dry peels on parchment paper, in a 200° oven, or a dehydrator until completely dry. Grind into a powder using a spice grinder like this. Use this Vitamin C powder in your homemade Anti-Aging Facial Toner! You can freeze your rinds (or even whole lemons) and use them in recipes calling for lemon zest. You can also zest your fresh lemons before using them, and store the lemon zest in the freezer. Store flat in a zip-top baggie so it’s easier to break off a chunk of frozen lemon zest. Allow to thaw before adding to recipes. Add small amounts to foods, smoothies, or desserts for a bold flavor. Cut rind into strips and dry on parchment paper, in a 200° oven, or in a dehydrator. When completely dry, store in glass jars and label. Use in baked goods, tea, or other recipes. Although I’ve never tried this one, they sound delicious. I see candied lemon peels on top of gourmet desserts in some of my favorite bakeries and cafes. Make your own using the instructions found here. Lemon pepper chicken used to be one of my favorite dishes. But it required I buy a special bottle of lemon pepper to season with. Well, one thing I’ve learned in the wonderful world of DIY-ing is that you can make your own. Simply dry lemon peels on parchment paper, in a 200° oven, or in a dehydrator. Once dry, chop into smaller pieces and add to a grinder with whole peppercorns and coarse sea salt. You’ve just made a delicious seasoning for your next dinner! Toss your leftover fresh or dried lemon peels in your fireplace or wood burning stove to add a delicious lemony scent to a room. Dried peels will help ignite the wood around them because they contain oils that make them burn longer. If you don’t have a fireplace, you can simmer lemon peels on the stove top. In a medium sized pot, combine lemon peels with vanilla, cinnamon sticks, and water. Simmer over low, periodically adding more water when needed. Citrus is a known cat repellent. If you want to keep cats out of a garden or indoor plants, you can scatter your lemon peels around or mulch the surface of your soil with citrus peels. Keep cats off countertops or shelves by placing your lemon peels in small bowls on these surfaces. Spray your citrus/vinegar cleaner on rugs or around doorways of rooms you want your cats to stay out of. If your garbage cans are starting to smell funky, you can put lemon peels in the bottom of the can underneath your garbage can liner. (Do not add lemon rinds with the pulp, or they will start to mold.) Replace every few weeks to keep garbage cans smelling fresh. If you have lemons that were cut in half and juiced, you can use those lemon “cups” to start seeds indoors. Poke a few holes in the bottom of the lemon if desired (for drainage), fill the lemon halves with soil, and plant your tiny seeds in them. This entire lemon cup can be planted outdoors in the spring. Did we miss anything? What clever uses have you come up with for lemon peels? Hi – do I assume that the All Purpose cleaner is not used full strength, but adding just a bit to water? How much of the infused vinegar do I need per cup of water? Thanks! You can use the all purpose cleaner full strength or cut it by 50% with water. I’ve done both. Wow.. thanks a bunch for this!! I had to blog your site with a link to here because I really have been looking for a place like this for a while.. im a green smoothie enthusiast and use lemons and limes on an almost daily basis… now i have purpose for the remains!! Glad you’re liking the info! Blessings. Awesome! I knew I was wasting the leftover rinds from my daily health tonic. Now I know what to do. Squeeze a lemon into the washing machine when doing the laundry whites and the clothes will come out extremely clean and fresh smelling!!! Being a Prep Cook at a family restaurant chain – some days I’m the one who slices the lemons for the servers. In slicing the lemons, we cut off the ends of the lemons first. I bring all the ends I get home and use those for all sorts of purposes. Including using the microplane grater and saving some zest for baking with. I still have to buy some ‘real’ lemons for lemon juice, but I end up with an almost unlimited amount of lemon peels! I freeze my lemon peels, and then put them in the garbage disposal. It saves the step of adding ice!! Nothing seems to stop my cat Buddy from getting into stuff. I tried unsuccessfully to have some flowers on year in a stand up raised flower thing on legs that i bought and he would dig in it and dig the flowers out of it so i tried lemons and even a whole jar of cayenne pepper nothing worked, he still would get into the flowers and dig them up or go potty in the dirt so i got rid of anything flower and dirt related.